I have always had an affinity for bagels! I remember getting these amazing bagels just down the street from me when I first moved to Los Angeles. Those bagels were huge…about the size of my head. I would get them with Jalapeños and Cheese on top. Sooo good! It was at that point that I first realized that a traditional bagel was water-boiled first. You do that to get that really nice crust and soft chewy interior. So when I was looking at doing a Keto Bagel, where boiling was going to be highly unlikely, I was questionable about the results I would get. The great thing about this recipe is that the Mozzarella Cheese helps to give you a really nice, chewy crust and dense interior. You truly get the satisfaction of a bagel without all the carbs. 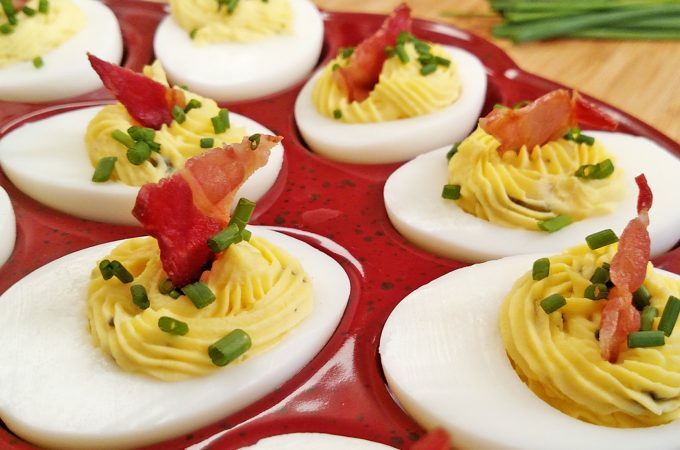 Perfect for your Keto Diet! 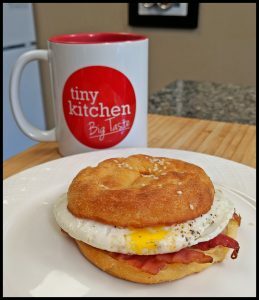 Even great if you’re not on Keto…especially if you use these Keto Bagels for a Breakfast Sandwich—maybe an egg, some bacon or sausage—because the cheese is already built into the bread. Doesn’t get better than that! Let me know what you think! 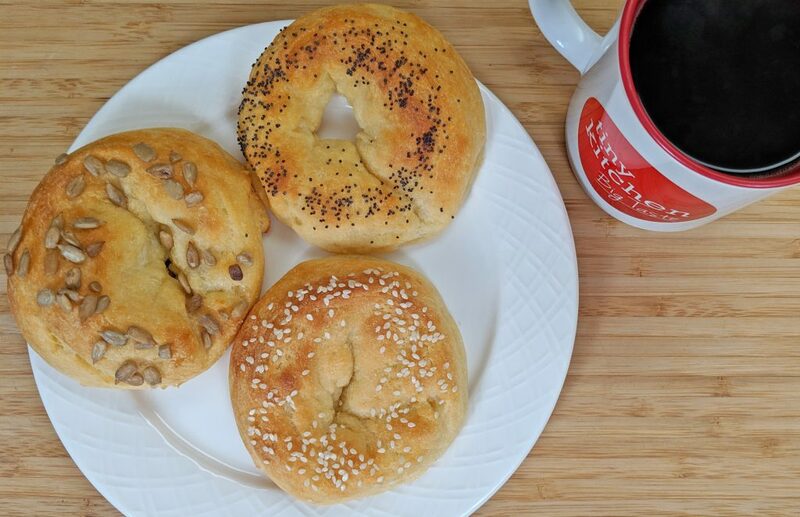 And when you make these bagels, tag us in a photo on Instagram (@tinykitchenTV). I always love to see your creations! 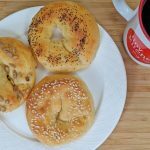 Great with Cream Cheese, Butter or as a Keto Egg Sandwich, there Keto Bagels are so easy to make! 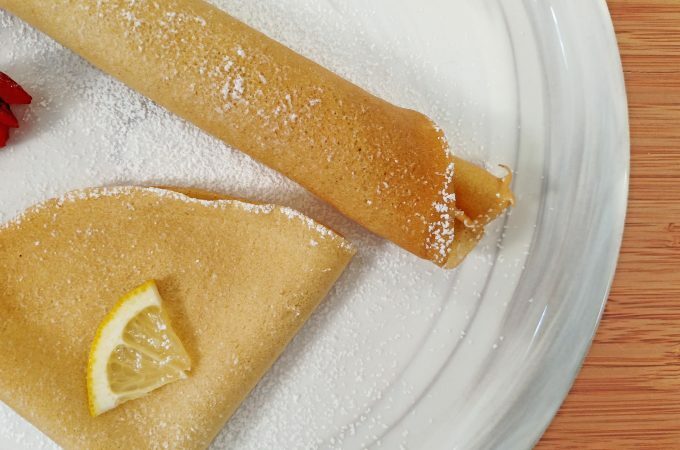 In Medium Bowl, combine Coconut Flour, Baking Powder and Xanthan Gum. Give a mix to combine. 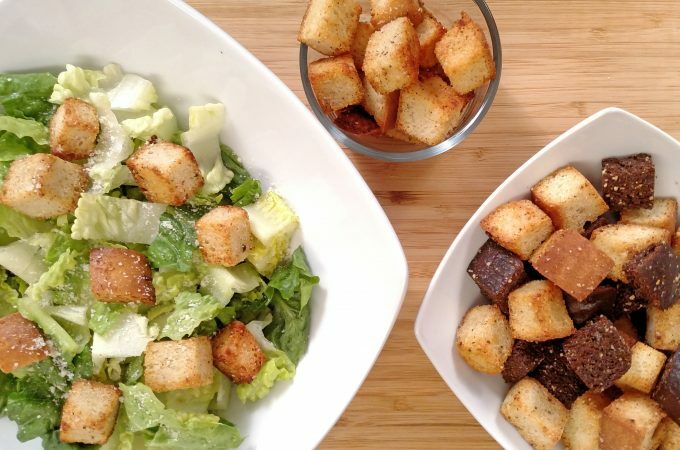 In a Large Microwavable Bowl, combine Mozzarella Cheese and Coconut Oil. Pop in the Microwave on High checking and stirring every 20 seconds until the Cheese is melted. To melted Cheese, add dry mixture and stir. Add Egg. Knead in bowl until the dough comes together. Turn out dough on Cutting Board and continue to knead until thoroughly combined. Break into four even pieces. Roll each piece into an 8 inch long rope. Connect the ends and pinch together. Place on Silicone Baking Mat lined Baking Sheet. Do the same with the rest. Place in a 350°F Oven for 15-20 minutes or until Bagels are golden brown.